SEATTLE – Pete Carroll prefers baggy pullovers to Rodney Dangerfield’s throat-choking tie. Respect doesn’t seem to be an issue. Self-respect is another matter. So the shocking upset the Seattle Seahawks pulled on Saturday – a 7-9 team knocking out the defending Super Bowl champion New Orleans Saints 41-36 in the first round of the National Football League playoffs – was not born of America’s sneers that the Seahawks didn’t belong. Well, at the moment, it might be an all-purpose tool. The Seahawks would actually have to win the Super Bowl to finish the season with a record over .500. Then again, the players themselves have plenty of it going on. Defensively, that was mostly hanging on for dear life while Saints quarterback Drew Brees strafed them for 404 yards. But there were some critical exceptions. Three times the Saints pushed inside the Seattle 10-yard line and had to settle for field goals, a turn-about from these teams’ meeting in November, won by the Saints 34-19. There was also linebacker Lofa Tatupu’s fourth-down stop of Julius Jones midway through the third quarter. And finally safety Kam Chancellor’s pass breakup that forced a punt when the Saints were trying to complete a comeback in the fourth. The offensive successes were much more spectacular – four touchdown passes by Matt Hasselbeck and a game-clinching run by Marshawn Lynch that was too good for even highlight reels. The Seahawks were nursing a 34-30 lead and Brees was waiting for his chance to finish that off when Lynch fired into the line on second-and-10 at the Seattle 33. He ran through linebacker Scott Shanle – and the tackles of six other Saints. Cornerback Tracy Porter was stiff-armed to the Qwest Field turf and when end Alex Brown was finally outlegged, Lynch vaulted over the goal-line in a showy celebration. “He’s a clown, so I know he was going to style a little bit,” said Seattle linebacker David Hawthorne. By the time the Saints got that touchdown back, they were out of timeouts and only 90 seconds remained. John Carlson gathered in the onside kick that was the now-dethroned champs’ only chance. 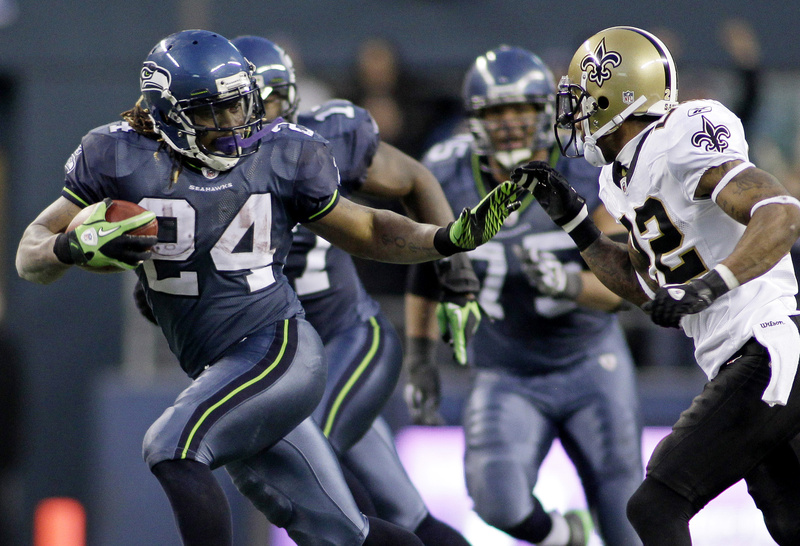 All this drama played out after the Seahawks had spotted New Orleans leads of 10-0 and 17-7. “There were so many chances to just say, ‘Ah, OK, not today – we’re just lucky to be here,’ ” said Carroll. Now they live to play another week, either at Atlanta or Chicago. Meanwhile, the other participant in last year’s Super Bowl, Indianapolis, also fell Saturday to the New York Jets. And whether Carroll believed it or not, Brees thought the Seahawks’ underdog role served as motivation. “Absolutely,” said Brees, who completed 39 of 60 passes after injuries to Reggie Bush and Julius Jones depleted New Orleans’ corps of running backs. “They didn’t play like a 7-9 team today or a team that had lost, what, seven of their last 10? Meanwhile, the Seahawks dropped the Saints to 0-4 in road playoff games.